Installing concrete pavers can significantly enhance the aesthetic of an existing municipal plaza, or add definition to features of public spaces such as crosswalks and paths. Under the right circumstances, it is possible to lay pavers over existing asphalt or concrete to simplify the project and reduce cost. 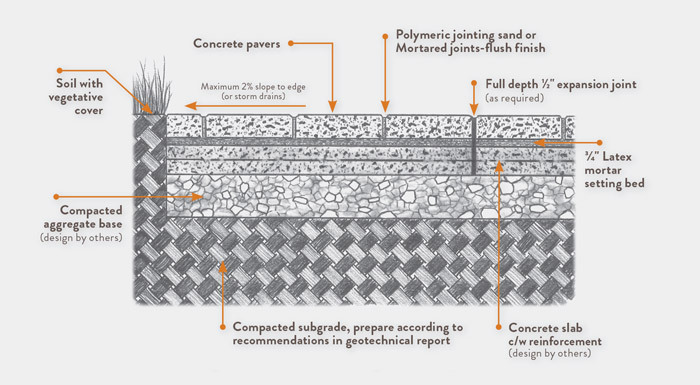 When installing pavers over existing concrete or asphalt, there are three primary installation options: sand set, bituminous set and mortar set. 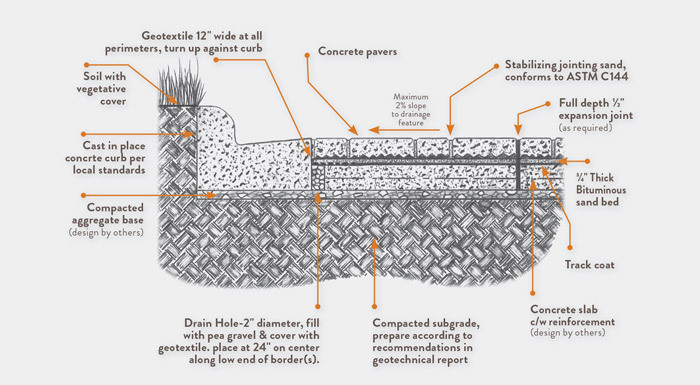 Outlined below are the details for how to install pavers over concrete or asphalt and the use cases for each of the three installation options. One important step in this process is determining whether the existing concrete or asphalt on the job site is in good enough condition to be overlaid. Major defects in the concrete base, like large cracks, will compromise the integrity of the paver installation. Another important factor is ensuring you allow for proper drainage of the site. Ensure that the concrete base slopes away from any structures and storm water runoff has been accounted for to prevent accelerated erosion of the surrounding area and so that the installation will remain in good condition. Step 1: Place a level 1" sand bedding layer between the pavers and underlying asphalt or concrete, similar to a standard installation. Step 2: Place draining holes at low spots to allow water that seeps into the joints to escape. 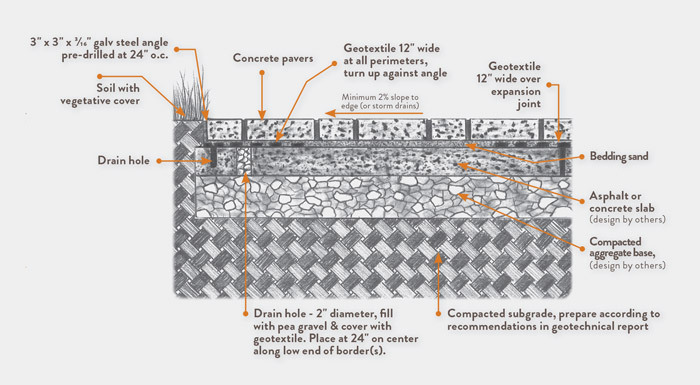 Step 3: Complete your paver installation, following the directions provided with your pavers. Step 1: Place a level 1" bedding layer of sand mixed with bituminous binder between the pavers and underlying asphalt or concrete. Step 2: Ensure draining holes are placed in low spots, allowing water that seeps into joints a place to escape. Step 3: Complete your paver installation, following the instructions provided with your pavers. Step 1: Clean the concrete surface of all dirt, oil, and debris. Allow to dry. Step 2: Place 1/2" of latex modified mortar underneath each paver, adhering it to the concrete. Work in small areas to ensure the mortar stays wet for paver application. Step 3: Place the same latex modified mortar into the joints around each paver, similar to what is done for ceramic tiles. Step 4: After the mortar has dried, use a brush or mortar striking tool to remove excess mortar. Step 5: Finish your project by applying a paver sealer. In northern climates, the mortared joints need to be regularly maintained to prevent moisture penetration, and the use of de-icing salts is discouraged. Ready to get started? View a few of our favorite overlay pavers suited for commercial applications below.